I'm not sure if this is something that I've mentioned too much on my blog, but I absolutely love going to gigs. I did a post on Leeds festival, but festivals and gigs are just on two different levels in my eyes. I have no problems with being up early to spend god knows how much on gig tickets as soon as they are released, which was the case with the White Lies tickets. As soon as they released the details of the tour and I saw the nearest venue was in Leeds (even though they've now announced Newcastle in February, which I may or may not be going to), I just had to go! I'll admit, J was a lot more excited than me and he treated us to the tickets without hesitation. So who are White Lies? They're a three-piece band from London, consisting of Harry on vocals and guitar, Charles on bass guitar and backing vocals, and Jack on drums. I've had huge love for them ever since I first heard Farewell To The Fairground, which I actually set as my MySpace song for soooo long (remember how you could have a song playing when someone went on your page? Yeah, that.) They're one of those bands that sound just as good live as they do on CD, which is something that's hard to do these days. But what I love most about them is that they're not afraid to experiment and put out music that is so different to their past sounds. For example, if you listen to To Lose My Life from way back in 2009, and then listen to Take It Out On Me from their new album, released this year, it's just completely different. Harry still has that sombre voice that we know and love, and it's super bassy, but it's more electronic and upbeat. Of course, if you listen to everything in between, there is natural progression, but it shows that they can develop and move with the times. Wikipedia describe them as a post-punk band, but I think they're much more indie/alternative. They're often compared to Joy Division and Echo And The Bunnymen, so definitely check them out if you like the sound of that. I think they'd also appeal to fans of Editors, Interpol and We Are Scientists. Plus, if you like an artsy music video with gorgeous colours, beautiful framing and stories that just beg to be picked apart, take a look at their Vevo, particularly Take It Out On Me (be warned - this one isn't PG), Bigger Than Us, and their most recent single, Hold Back Your Love. But let's chat about the gig itself now, shall we? First of all, the Stylus is SO hard to find, especially when your sat-nav takes you to the wrong car park. We had to walk through a bit of a dodgy-looking area for what felt like ages in the cold, J fell in mud, there were building works all over the outside of the Students' Union, so we couldn't find our way in - honestly, it was such a palava. And I'll admit, as we were queuing to go into the venue, I was a little dubious about the whole place, but I was so surprised when we actually got inside. It was so lovely, with a balcony all the way around the lower standing area. We would normally have gone down into the standing area, but this time, we opted to stay up on the balcony. The view was absolutely perfect, so we were more than happy. 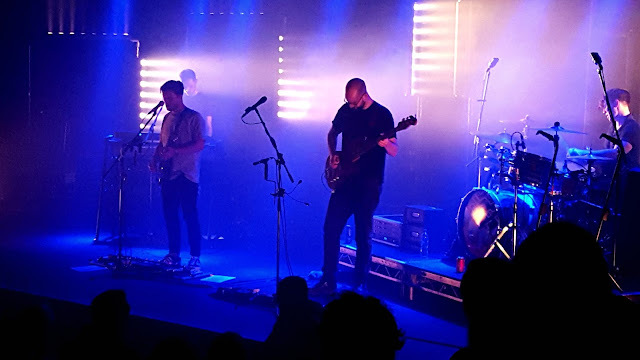 While the venue was quite big for a University, it was the most intimate White Lies gig I've been to due to its size. The other three times that I've seen them, it was either at a festival or an O2 Academy, so this was very different! The support act were The Ramona Flowers, and they were probably one of the better support acts I've seen, sound-wise. I think they did struggle to get the crowd going a little, but their music wasn't too bad. Mind you, the audience were a rowdy bunch, so their attention wasn't going to be had until White Lies came on it seemed. They're an eighties-inspired indie band, so they were ok, but they didn't grab me too much. 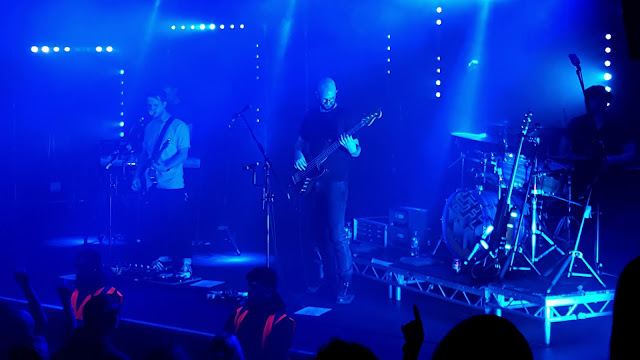 As soon as White Lies walked on to the stage, the whole building erupted into cheering. Their stage entrance is always very understated, and this gig was no different. They simply just walked on to the stage, gave the crowd a little wave and picked up their instruments. 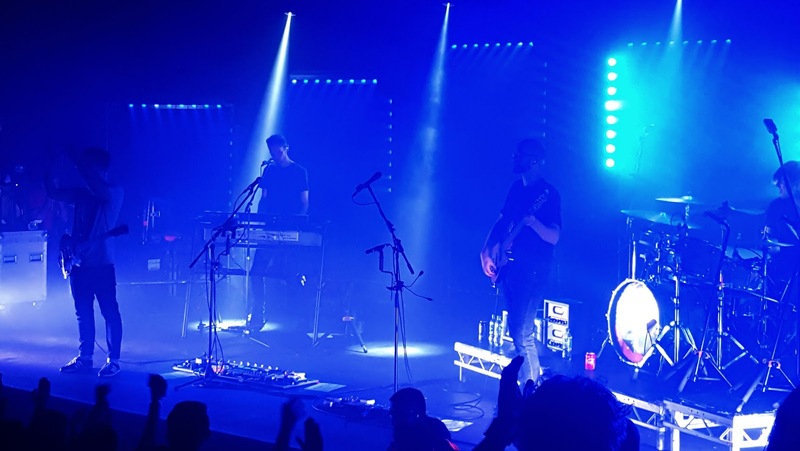 Where a lot of bands might have a huge build up, White Lies just get on with it - I guess this either a love it or hate it kind of thing, but I quite like it! They had a really great mix of songs from the new albums, fan favourites and songs that are a rarity to hear live. Honestly, when they broke into From The Stars, I did a little scream because I never thought I'd get to hear it in person. I was hoping for EST, but maybe next times (guys, if you're reading this, get EST on the setlist!) While I didn't know a lot of the words to the newer material, I belted my heart out to the ones I did know and danced along to the new ones. I'm a bit funny in my ways, as I'm always funny with listening to new albums. I get so attached to older albums that I struggle to tear myself away from them - stupid, I know. After seeing them perform the newer songs live though, I've really got into the new album and it's currently the one I yell along to in the car. Something I am always astounded by is Harry's voice when performing live. It's said about a lot of people, but he sounds just as amazing live as he does on recordings, and I'm being completely truthful. When listening to the albums, I'm amazed by how low his voice can go and how brooding he can sound, but it's exactly the same live. It really is incredible. All of them are so extremely talented, but there's definitely something about Harry's voice. The best songs for me were Is My Love Enough, as you could just see how much they all enjoyed playing it and there was just so much passion there; There Goes Our Love Again, which really got the crowd up and dancing; Bigger Than Us, because it's just such a good closing song; and Death, because that is my absolute favourite song. J is obsessed with Big TV, so when they started the encore with it, he FREAKED. OUT. He also really enjoyed Farewell To The Fairground, The Price Of Love and always Bigger Than Us. 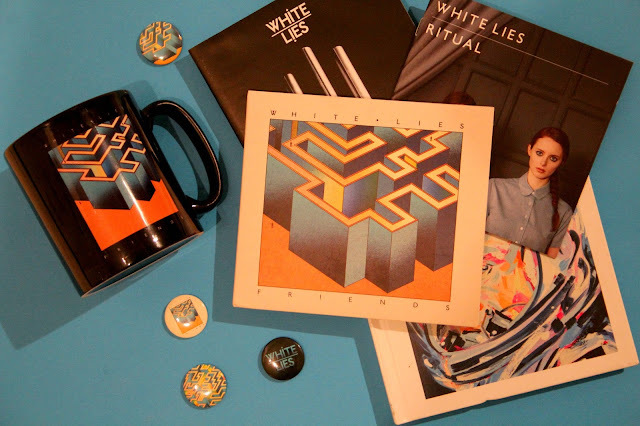 If you've made it this far in the post and are interested in listening to some of White Lies' stuff, some songs you should check out are Farewell To The Fairground, Death (I promise, it's not as morbid as it sounds), Bigger Than Us, There Goes Our Love Again, and Come On. We had a really great night, despite not being able to find the venue and getting really sweaty, and I just can't wait to see them again! Like I mentioned, they're coming to Newcastle in February, so J and I are very very tempted to get tickets. Keep your eyes peeled for any further updates!